BMW's innovative 360-degree collision avoidance research put to the test in a Las Vegas parking lot. Most modern automotive manufacturers are on a quest to put panel beaters out of business. Or, if you toe the company line, create a glorious world that is completely accident free and safer than a Lionel Richie song on a wedding playlist. BMW is one of these automotive manufacturers and it was keen to show off its latest 360-degree collision avoidance system, which can scan a vehicle's surrounding and automatically apply the anchors should a driver fail to see the big brick wall he or she is speeding towards, at this year's CES. 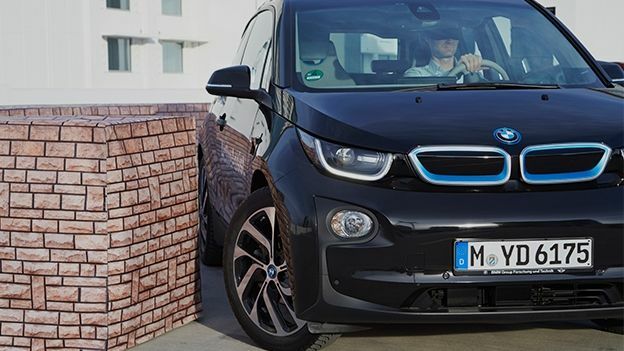 Although the technology is still very much still in a research phase, the German carmaker happily let T3 clamber behind the wheel of an i3 retrofitted with the kit and drive at speed towards obstacles in the dimly-lit car park of a Las Vegas hotel. 360-degree collision avoidance: What is it? From the outside, it looks just like a BMW i3 with a few additional pieces of exterior plastic but underneath the modest exterior is a host of technology whirring away. Radar, laser, camera, infrared and the latest Lidar tech is called into action, which allows the i3 to constantly monitor its surroundings and highlight any potential hazards. The additional pieces of plastic mask the exterior radar technology, which is mounted on the front and flanks of the vehicle, while heavyweight computers have been placed in the boot to operate the advanced system. Obviously, the technology will be far less crude and bulky if and when it appears on a production model. 360-degree collision avoidance: What does it do? At the moment, the technology runs in the background when the car is travelling at speeds of up to 15mph. The highly advanced laser scanners monitor the surroundings and identify obstacles, such as other cars, pillars, walls and hidden bollards. If the driver heads towards one of these unseen nasties, the system starts to automatically apply the brakes and eventually brings the car to a stop. If BMW introduces the technology to production cars, drivers will be able to turn the function off at any time. 360-degree collision avoidance: What is it like to live with? My brief test took in a short route that was meant to mimic everyday driving situations, so I was faced with a few foam breezeblocks, some tricky parallel parking scenarios and a tight corner that was flanked by walls. My brave host pointed at one of the large foam obstacles and told me to drive straight at it. Sure enough, the system kicked in and gently brought the car to a standstill before I had an embarrassing spongy encounter. Similarly, during a parallel parking exercise, the car applied the brakes before I reversed into a wall. Once I had clocked the obstacle, I was told to simply stick the car in drive or reverse, apply the accelerator and drive out of its way. I tried as hard as I could to continue reversing into the wall but the i3 flat out refused to budge. Perhaps most impressive was a demonstration of the radar technology's precision, which saw me speed towards a gap in two foam walls that clearly wasn't wide enough for the car. As I raced towards my impending doom, the computer analysed the speed and measurements and gently slowed the car, leaving the bumper just millimetres from the obstacle. It's amazing stuff and even more impressive considering the system applies the brakes gently rather than giving the driver whiplash. The system even worked to protect the flanks of the car and slowed the vehicle down to a gentle stop when it thought I had strayed too close to a wall during a tight left-hand corner. According to Georg Tanzmesiter, BMW autonomous vehicles research engineer and owner of a badass name (it translates from German to 'Dancemaster'), the technology is still some way off. "The radar systems are still extremely expensive, so we need to find more cost effective solutions for production vehicles," he told us. But by all accounts, the system already works pretty well in everyday scenarios and arguably can't come soon enough for those of us prone to the odd car park prang and scrape.